That’s actually the name of a political party here in New York; yet another reason that makes me love this city, though I must admit I’ve never actually voted for it. That’s exactly how I felt about my many health-related behaviors until recently. I knew I was devoting a fair bit of time and brain space on tracking, on analyzing the data, on reading health blogs and newsletters, on exercise, and just generally thinking about all things health-related. I used to think of it as this slightly nutty hobby, perhaps a bit over the top but mostly a good thing, since anything to do with health is good, no? Even if some of this is taking place consecutively, we’re talking over two hours a day. That’s the rent I’ve been paying on this crazy obsession. Well, there is an opportunity cost to spending over two hours a day on thinking and doing health-related stuff – namely, all the other activities I could have done or thought about instead. Two hours a day is 1.5 months a year, assuming a 16 hour day. Now, I’m not saying all this time was wasted – doing exercise is generally a good thing, and occasionally thinking about your health is probably wise. But even a month spent learning a new skill, with my family, studying, reading or who knows what else would have yielded greater dividends. This is an art installation by Darren Almond, an English artist and photographer, that I saw well over a decade ago, but it stayed with me. 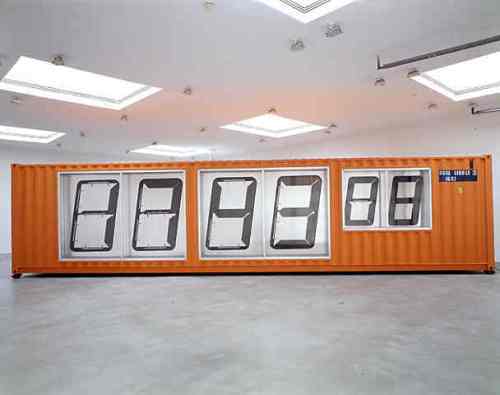 It’s a giant clock the size of a shipping container. Every second a number flips down, just like with a much smaller alarm clock. While it looks rather mundane in pictures, it is as an installation quite haunting. The numbers turning over create the relentless noisy drum beat of time passing by, of a countdown to some unknown end, an urgency to hang on to time that’s evaporating in front of you. You only live one life, so be careful who you are paying rent to. “Be careful what you spend your rent on.” What a resonance this has for me. I too have lived in NYC and paid both the rental agent and the landlord an exorbitant amount of my whole net worth. This is quite obvious, but your meaning reaches the depths of my values. I think we are a lot alike. I have spent a tremendous amount of rent, thinking about being healthy. Like you, I believe that health is a positive experience, but it does get expensive when I spend the rent thinking or worrying about health. The rent goes down significantly when I am actually doing exercise and eating well. It’ the resistance to change that bears the weight of the highest rent of all. I hope that with this blog you are able to find your freedom and are able to reach a place where life and love flow rather then being counted and disected… it is a journy I will be fallowing and excited to see your change. I am not a counter or a worrier or even really a health nut. Just a woman who looks for balance in all things and hope you find yours. I love your brain. I also love the way you express through your words. Words are so wonderful and can be very comforting. I have obsessed about my weight for many years. I have experienced many diet programs over decades. Finally I found Nutri/System and it worked completely for me. When I was in my late forties I worked the plan while I enjoyed life in England. I lost quickly. Now in my seventies I tried it once again in January; dropped twenty-five pounds am working out like a young man and enjoying life beyond belief. It is indeed a battle for some especially me and has been most of my life. But I have finally leveled off and feel great. I am about to write a blog about lifting weights at my age, how I was inspired and where I am today because of it. Just got the pic I wanted for the piece, now the text. Finally, and gratefully the answer has come with great results. Carry on my friend you are doing better than you think.